Pristine - From a 1997 sold out release. Twelve (12) Tuskegee Airmen signatures including General B.O. Davis, Jr.
Includes Certificate of Authenticity along with the original biography booklet. 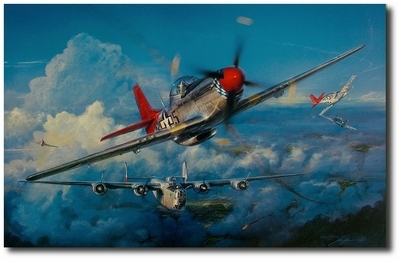 Overall size: 34.5" x 26"
Image size: 28.5" x 18.5"
A Salute to the Tuskegee Airmen of WWII The Red-Tail Angels, so titled because of the nickname given to the Tuskegee Airmen by Allied heavy bomber crews who often requested them as escorts. These all-black units of patriotic Americans proved to be some of the finest pilots of WWII. Commanding Officer General Benjamin O. DAVIS, Jr.